During each year's harvest, Wine Spectator asks several different winemakers to share their thoughts on the challenges of the season and the quality of the grapes they're picking. Since there are so many factors that can influence the timing and quality of the harvest, ranging from the region to the variety to even the experience or opinion of the individual winemaker, it's often difficult to get a true sense of what's happening in the vineyards. This year, Wine Spectator found winemakers who specialize in certain varieties to sound off on their individual, grape-specific experiences—right in the middle of harvest. Mia Klein established her wine label Selene in 1991 after nearly a decade of working in Napa, at Chappellet and Robert Pepi, and as a consultant, alongside Tony Soter, at Araujo, Spottswoode and Viader. Klein continued to work with Soter's clients when he left the consulting business in 1999. A graduate of the UC Davis enology program, Klein makes her wines using fruit from Larry Hyde's esteemed Carneros vineyard. Klein spoke to WineSpectator.com last week about this year's early harvest, night picking and the virtues of Sauvignon Blanc. The Geography: Hyde Vineyard, Carneros, Calif.
A warm summer got things moving quickly: "We had a really wonderful July and first part of August. Normally we can get some real good heat spells, but we stayed below 90 degrees for the most part. And the nights were relatively warm, for Napa standards, rarely if ever going below 50 degrees Fahrenheit. Those two [factors] together mean the vines are always photosynthesizing. … The fact that the nights were a little bit warmer and the days weren't too warm added up to nice ripening weather and also led to the early harvest. From the latter part of August up till now, [temperatures have] been a little bit above normal, so it's been a real scramble to get things picked. … It's one of those years, too, where it's not just early, but a lot of varieties are kind of piling up on one another—varieties that would normally be separated by weeks." And yields are way down in this dry 2007: "It started out with a drought in winter … there wasn't anywhere in the north part of the state that had any more than 50 percent of what normal rainfall would be. The good news is that we had two good rain years before this one, but still, the vines started with less than a full water profile, which set us up for the smaller harvest that we're having right now. We're about 25 to 35 percent down from last year." In a year like this, it pays to get to the vineyard early: "I get up at 4 o'clock to be out at the vineyard no later than about 6:15. We have enough available light to begin picking at 6:30. This time of year, especially in a year like this, where everybody is scrambling for pickers and there are multiple picks going on, you want to be the winemaker who's on site, to make sure your stuff gets done first and you get the best picking crew. … Then you're pulling stray leaves out of picking boxes, and figuring out with the grower an approximate yield. That's got to be done quickly so you can get everything set up at the winery—tank assignments, barrel plans, that kind of thing." Too much ripe fruit and not enough hands: "The main reason it's difficult to find pickers right now is that everybody's picking at the same time. There are only so many people out there, and they're spread more widely than usual. Varieties are piled on top of one another, and you can imagine, if you have to pick that many more grapes at a time, it's hard to find pickers, because they're working everywhere. A lot of people are using a bit more night picking … it's cooler during the nighttime hours, and in general, people can pick more, wineries receive the fruit earlier, so they can process more fruit faster. We're all trying to solve this [labor] issue, but right now it's about the kind of vintage we're having. Which is not to say of course that labor isn't something we all think about in a long term way." Keep it simple and by the book for Sauvignon Blanc: "I only use purchased yeasts for fermentation. Especially in a year like this, when sugars are running a little bit higher. Occasionally with reds, I'll do a natural fermentation, but with whites, it's very rare that you can get [the wines] all the way finished [with natural fermentation]. [Selene Sauvignon Blanc] is sort of my baby. It's one of my basic ways I make a living, and I can't afford to ruin stuff. There are many wonderful yeasts, cultured yeasts, that are available, and you can get the characteristics that you want. Sauvignon Blanc is one of those varieties that can be anything from A to Z. It can be a very crisp, herbaceous, gooseberry sort of wine, like you can get from some of the New Zealand producers, for example, all the way to the other side, where you see barrel fermentation with all new oak and malolactic and the whole nine yards, and you can barely tell it from a Chardonnay. 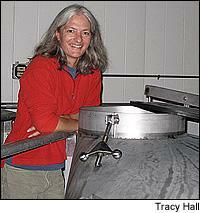 For me, being a Sauvignon Blanc producer, I don't want malolactic fermentation. I like to keep my Sauvignon Blanc a little crisper. This is the 16th year I've made this wine from Hyde Vineyards, and it does have a pretty distinct style, so I don't want to move too far off the line. Malolactic is probably the thing that we guard against the most. I'm fairly lucky, in that the grapes I purchase from Larry have a very low pH and fairly high acid, which malolactic bacteria don't like. And I do add just a small amount of sulfur dioxide. Could this vintage be another 1989? "I asked Larry Hyde, about midsummer, what harvest this year most reminded him of, he thought for a few minutes, and then said, '1989, for sure,' and I said, 'Larry, I hope you're wrong!' [Laughing.] Because in 1989, we had some unusual rains during the harvest season, and there were quite a few white grapes—Chardonnay, Sémillon and a little bit of Sauvignon Blanc—that went unpicked. It was one of those rare harvests where we got rain during the harvest season. Right now it doesn't look like that's happening, but it is hurricane season, and that means, in the Pacific, some tropical storms. … When I was starting to pick Sauvignon Blanc [two weeks ago] we saw the remnants of one of the tropical storms kind of head up our way, though we didn't get any rain in Carneros. Tropical rain is the worst kind of rain, because [the air] stays warm afterward, which makes it double trouble in terms of rot. … With white grapes, if you get more than a quarter of an inch, you can have some issues, because their skins are a little more delicate, but so far so good."